oh, sweet joy! : the *BIG* reveal!! a closet sewing space - it CAN be done! the *BIG* reveal!! 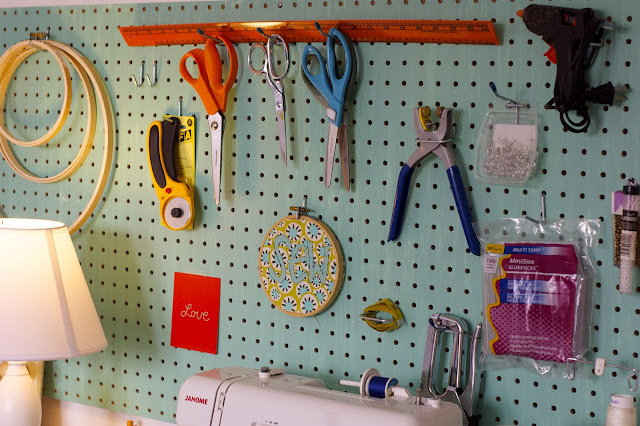 a closet sewing space - it CAN be done! Well, hello & Happy Monday. You lucky ducks get two posts in one day! I wanted to share my studio space with you today & I'm thrilled to do so! I'll be the first to admit that I had it made when we lived in Gunnison as far as studio space goes. Our entire third floor bedroom was huge, had hardwood floors, white walls, lots of light, and entirely dedicated to sewing. Unfortunately, I never got a photo of it. Probably because every bit of floor & table was always junked out with fabric. When we first got married, my sewing room was also a spare bedroom. So when we moved into this two bedroom condo here in Boulder, I knew it could be done...but that I would just have to get creative. And oh, did I get creative. Are you ready for this people? It can be done...a sewing space in a closet...and this is proof. Not pictured, but directly to my left from where I was standing to take this photo, is my cutting table. It's not pretty, so I didn't feel like it was important to show it. It's just my craft fair table with my cutting mat on it. Boom. A $4 thrifted bookshelf made into a pretty display of sewing books, odds & ends, patterns, and of course some fabric. close up of the peg board. my favorite little nook of the closet. the machines//my day time companions. i love love my little fabric covered tin cans. once holding corn, tomatoes, and cream of chicken soup...now holding sewing tools (read: seam rippers), writing utensils, & clothespins. *I bought the peg board and hardware for said peg board at Home Depot for $12. I had some Krylon Indoor/Outdoor spray paint and went to town painting it my favorite color. *I hung up 2 clip boards that I had covered with scrapbook paper. I'm hoping that will keep me organized with orders. *Fabric covered tin cans, described above. *Lampshade & Lamp: $6.99+$9.99 at Target. *I had the plastic storage drawers on the left from when I worked at camp. *Keep Calm & Sew On poster. I won this from a giveaway & put it in a $4 frame from Target. *In my opinion, you just can't beat beautiful fabric framed in embroidery hoops. *Bunting flags from my Handmade Market table set-up. *Vintage Spool Holder with a mix of vintage & new thread. I hope you are inspired & encouraged to know that you don't have to have an entire room to have a space to yourself to create. It's all what you make of it! Get creative, friends. Ah-mazing! I love love LOVE it! This looks awesome, I'm sew inspired! So I've been destashing like crazy (I worked at a fabric shop for 5 years so be easy on me ladies--the employee discounts are hard to avoid!) I'm ready for an inspiring workspace and girl, you have totally inspired me. If you can organize your space in a closet, I should be able to work with my odd shaped room in the basement. :) Thank you, thank you! very cute! love all the colors and how you fit it all in your closet! oh my goodness!! this is SUPER SUPER SUPER cute!! i need some tips from you~!! mine is horrible! maybe i should spend some time organizing and redecorating too.. and i even have more than a closet too but i am just soo bad at home design!! ahhh i am in love, this needs to go into like a magazine or be pinned on pinterest 1000 times!!! 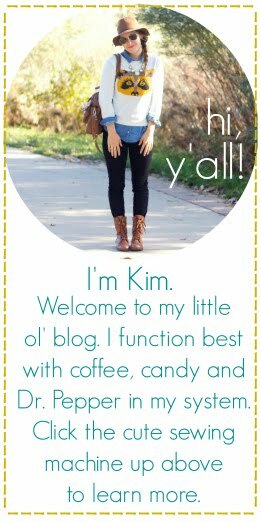 SUPER CUTE KIM :) & very functional!! Love it! I have a small sewing space too, it's always a fun challenge to try to get use out of every little inch! Great job! this is a beautiful space! I am about to redo my sewing area and you just gave me great inspiration! Thank you for the post! Very cute! I love the bunting across the top as well, so fun! I love love love it! So much fabulous color! That is certainly a space to get inspired in. :) Great job, girl! this is absolutely gorgeous! It looks like something out of Real Simple magazine. I wish I had the extra closet space to do this. Great work! Simply stunning. You have a wonderful eye for design! Are you out for hire? As soon as I have a studio... which comes directly after finding a house which comes after finding the hubs a job... I'm flying you in! im freaking out! this is aaaaaawwwwwesome! i love it, girl. you are so good!!! That is so gorgeous and I am officially jealous! I want a craft closet - heck, craft anything! Looks ahhh-mazing, Kim! I'm very impressed and inspired (to relocate my sewing machine from the dining room table...let's hope). Beautiful space, lots of inspiration will come! Get out of here!! That is so stinkin' cute!!!!!!!!!! How amazing! I'm totally in awe, and wishing we had a 2nd (or really 3rd) closet to transform into my workspace! adorable and cute! :) where did you get your "SEW" letters at? i love 'em! oh my! so lovely and so very inspiring! reading two creative space posts in one day (yours and gussy's) has made me want a space of my own even more now! you did such a great job! my parents are taking the kids while we clean up our spare bedroom next weekend. really it's to get ready for our baby due soon, but i might also be able to manage to carve out some crafting space...(crossing fingers)! This is beautiful Kim! Great job. I just want to go sit in there. It's perfect. absolutely amazing!!! I just decided 2 days ago to create a craft area in my room and you've totally inspired me! It looks so pretty! Such a nice job with the use of space. I'm still waiting for hubby to finish my studio in the backyard. Winter put a hold on it. Well winter and money! Hopefully this summer it will be done. It will be great to have a dedicated space to sew and create. I am in complete AWE! I absolutely love this! I don't even have a spare closet in my tiny apartment, but I have been dying for a sewing space! Yours is such an inspiration! I love every single thing about this work space! I can not wait until we live in a house big enough for me to have a sewing room...and not just the dining room table. um. if this isn't the most fabulous thing i ever saw i don't know what is. It looks GREAT, Kim! Way to go! 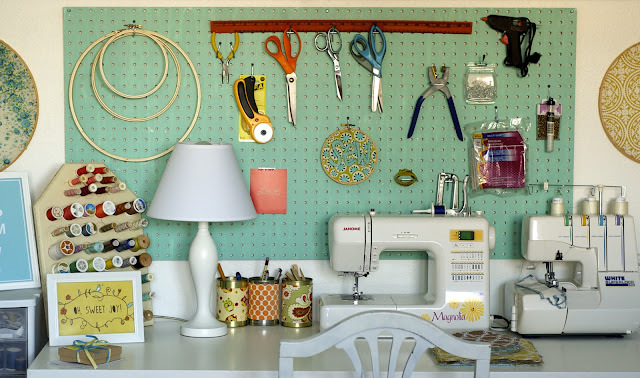 I had a sewing space several years ago in a closet like this. It wasn't any where near this cute. I might not have sold that house, ever, if I had your wonderful sewing "nook"! Very cool space. Love what you've done. I've just begun sewing, so my space is kinda crazy. I did a post on it, too, over at Ninth Street Notions. thanks for the motivation and ideas!! that is fabulous Kim. Thanks for sharing. I'm definitely inspired to redo my creative space. I loooove the mix of colors you have going on! It's very striking! And the fabric covered tin cans? Brilliant! Thanks for linking up at WWC! Drooling here - everything is so pretty!!! Homegirl sayyyyy whaaaaaa! This is gorgeous. Perfect. Beautiful. Fun. Light. & Perfect. love! this is definitely a creative use of space, & i love the colors!!!! thanks for the inspiration should i ever get around to setting up a sewing area... should i ever learn to sew! Super cute! And I love your colors. Now I wish my sewing maching didn't break during Christmas! Not only organized...but "sew" pretty too! I love it! It makes you want to go sit in there with a warm cup of coffee/tea and look at it! It's beautiful! Very cute and awesome use of space! 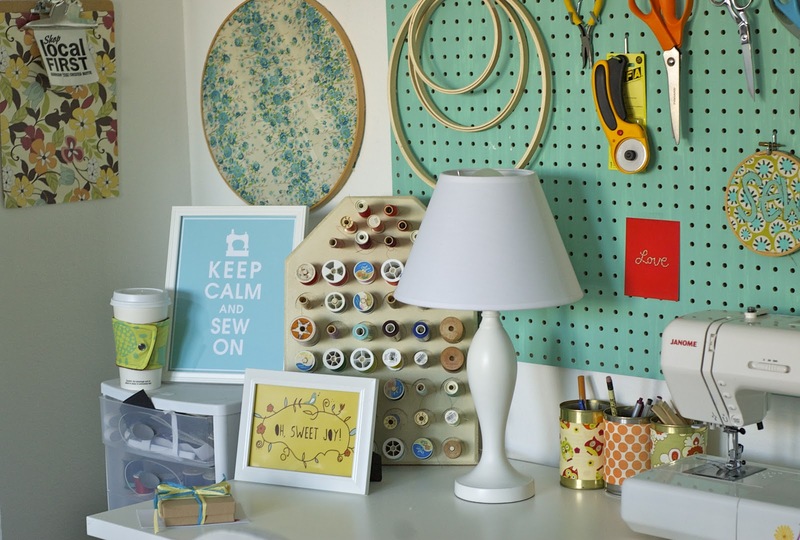 Love the peg board & love all the colors! Great job! This is like my DREAM!!!! holy moly!!!! I showed my husband and said -- someday, I will have this. hahaha! ;-) No room in our 1 bedroom apartment, but someday! Good work!! p.s. I shared on my blog! The colors are so vibrant and happy! This would be such a fun space to work in!! PS I LOVE love love your S-E-W- block letters that you covered in fabric!! I have been wanting to make something like that lately!! I saw this over at Tatertots and Jello and had to come over and tell you I LOVE your space and i'm pinning it on pinterest.com! I really love your bunting across the top too! I would love to sew in that space! Beautiful and yet fun! What serger is that? I am in the market for one :) Do you love it? Jealous...in a good way. What an amazing space you have created. It is inspirational. 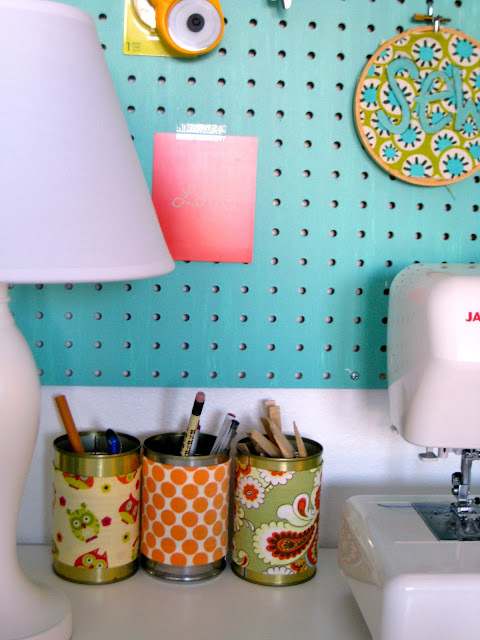 I'm in love with your painted pegboard! I think a hardware store run is in my near future! I have janome very similar to yours, but mine is red. I HEART it!!! Oh wow! I love how everything is so organized! It looks like so much fun - makes me want to pull up a seat and get creative! Great job! You made great use of the space. ummm im a liiiittle envious :) super cute. love it! might just motivate me to clean my super scary messy sewing room. prob not going to get any work done until it's all cleaned up :( i'm really digging the peg board! oh! this is SO BEAUTIFUL! Hello! Your space is lovely! So funny because I have a closet for a sewing room also! Mine is a lot smaller, however. :) If you're interested, you can see it here.. I am so pleased I found your blog, your items are so lovely! This is so darn adorable. I haven't figured out what to do with my office yet and this gives me ideas! Thanks girl! I think it is adorable, I love the use of a closet also. This is such a great use of space and I LOVE your colors! What a happy little space!! Annd we have the same machine!! YAH! So pretty and fresh - I just love the colours! 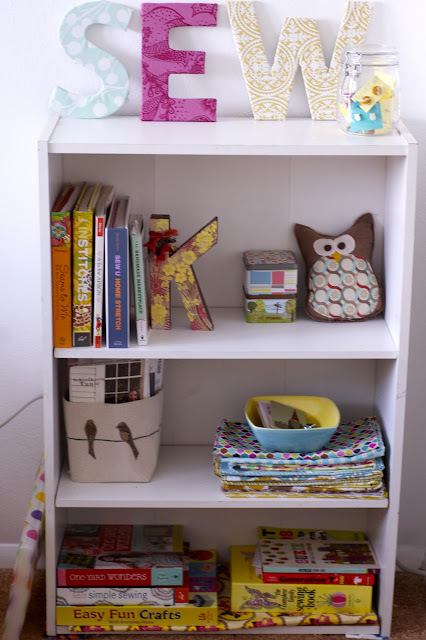 I've linked this to my craft rooms post too today, nice job! Love this idea!! It gives me some hope because that is all I have at this time to work with is a closet! Thank you for sharing your beautiful Idea! ((new product)) POLKA DOT PARTY! thanks & ahmelie giveaway winner! it's in the bag // blog crawl! the pleated polka dot giveaway winner!